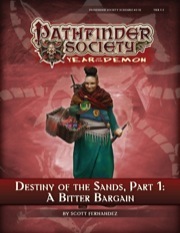 “A Bitter Bargain” is the first scenario in the three-part Destiny of the Sands campaign arc. 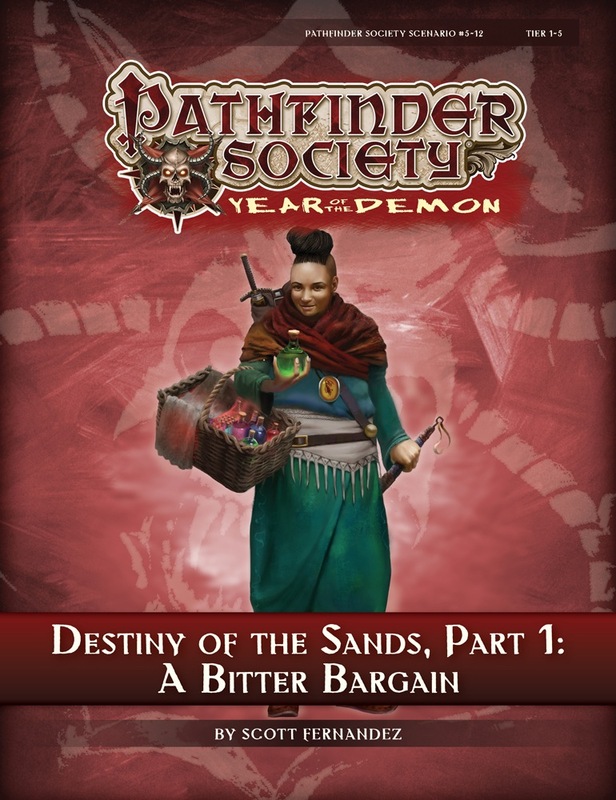 It is followed by Pathfinder Society Scenario #5–15: Destiny of the Sands—Part 2: "Race to Seeker’s Folly" and Pathfinder Society Scenario #5–16: Destiny of the Sands—Part 3: "Sanctum of the Sages." All three chapters are intended to be played in order. The Destiny of the Sands trilogy serves to answer two long-standing questions: what's the deal with the Scarab Sages, and whatever happened to Grandmaster Torch? And it ties these questions together well, as the recently-banished Amenopheus sends the party in search for the mythical lost sage jewels, and the person who has the information is none other than Torch himself. For characters new to the metaplot, expect an interesting city scenario as you work a diverse set of tasks in payment for Torch's information. The players are free in their approach here; anything from combat to diplomacy to sneakiness can work if planned well, so this rewards cooperation between diverse character types. For characters familiar with the infamous Grandmaster, expect a good opportunity to throw a wrench into his plans, as for each task you can fulfill the letter of the agreement in a way that doesn't actually benefit GMT's plans at all. Serves him right. But what are his plans? Stay tuned to find out! Overall, a well-written city adventure with strong ties to the overarching plot; expect more revelations to follow in the two sequels! The beginning of a three-plot-scenarios, hard to rate. Like most missions of Torch, you go A,B,C,D, arrange in any order, then comes to the end. I love the settlement of Eto, a very few experience of Osiriani city, and all missions rely on skills and creativity, that's what I like. The only downside is the sudden end, bit of disappointed, compare to First Steps, and Wounded Wisp, you know what I'm talking. Finally, LOVE you Torch!!! And beware of 0 pp!!! A great start to a three-part story arc. I played this scenario earlier today on the lower tier with a party of six. At the start of the scenario, upto the point where we had just received some tasks to take care of, we weren't really sure what to expect. I'd even go so far as to say that the introduction more or less failed to grab our attention and the tasks didn't particularly seemed like a lot of fun from the get-go either. And then we started doing those tasks. Slowly but surely the scenario unfolded into a really flavorful masterpiece. Like others said before me: this scenario offers multiple opportunities to solve problems by fighting, sneaking or role-play. What's even better is that each of these three methods can be applied to every single task, providing the party with a lot of freedom. This makes sure that a party feels in control and not forced down a single road, as is the case in some other scenarios. It allows them to have fun and enables them to focus the scenario on what they consider to be the most fun. We as a party attempted to role-play our way through most of the tasks, preferring diplomacy, bluff and intimidate over violence or sneaking around. Everyone chipped in equally - at times deliberately messing things up for certain other partymembers - and this made sure that the three characters with great social skills wouldn't be too overbearing and present and that everyone felt involved. Some of the harder checks were even successfully made by those with less charismatic natures. We avoided most fights, but we also didn't feel like we were missing out. We were all having a great time and at the end of the scenario all of us wanted to play the next one, making this a great first part to this trilogy of quests. When I first sat down to play this adventure with my LG Osirian Cleric I about slammed my head on the table when I found out what we were going to do. My least favorite PFS adventure of all time was The Many Fortunes of Grand Master Torch (TMFGMT) and this looked a lot like this was simply a redux of that adventure, and I just couldn't see how my LG character was going to deal with such an adventure. Fortunately, everything TMFGMT does wrong, A Bitter Bargain does right. Just like TMFGMT you are sent on several mini-quests by someone many PCs would rather attack on sight than do favors for. While this can be galling, the adventure actually allows for you to complete the missions and sabotage Torch at the same time. Something TMFGMT did not offer. Also, unlike TMFGMT, the author does not expect you to take the murder hobo approach as default but does allow for such play style if desired. Most of the missions can be accomplish without combat but most offer combat as an option. Completing them without combat requires some RP and some deductive reasoning skills. High social and rogue-type skills can also be useful, but clever uses of spells can frequently be substituted. All of the missions can be completed in any order. 1) One of the combats can be especially deadly for low level PCs. 2) You are going to get the most out of this adventure if your character knows of or has prior history with Torch. Announced for the end of January! Cover image is a mockup. I don't know if Amenopheus has it in him to deal with "familiar information broker", i am worried. Given Sczarni and Qadira participations, i guess he will have assistence. Boo! I want to play it this weekend! Doh, pushed back another day! I can't wait to see the cover art. I hope you all enjoy playing this as much as I enjoyed writing it. Please sell me this... SHUT UP AND TAKE MY MONEY! I wonder if it is possible for the scenario writer to comment on what flip-mats this and part 2 require? I'd like to make sure they are on hand when I run them, and as they time line for release is sliding I'd like to get as much lead time as possible. This adventure uses Map Pack: Slums and two custom, half-page maps. As a heads-up, the soon-to-be-released faction letters for the mid-season update provide greater context for this scenario's faction-specific goals. I will be finishing and posting the three relevant faction updates here tomorrow so that folks have everything they need to run the scenario this weekend; a blog with the official announcement of new faction head letters is coming soon. I love the cover art. The attention to detail of her gear is fantastic! Can't wait to see how it turned out after development. Looking forward to the results of this played out across the global player base! Gonna run that asap from next tuesday! Dang it. My still loyal to GMT and the True Lodge is outside the level range for this. 3. See my post in the product's discussion thread; new faction head letters are coming. Is someone implying that GMT is the new faction leader for Sczarni/Osirion/Qadira? he has been mentioned in recent Sczarni faction missions. What is this "former" you speak of. . .? Here are the faction letters for the three relevant factions. As you no doubt recall, our dismissal from the Ruby Prince’s inner circle made it possible for us to research the organization known as the Jeweled Sages, a society that dates back to Osirion’s golden age millennia ago. These men and women sensed the decline of their kingdom and began to gather the relics and wisdom that might otherwise be lost to the ages. Each sage carried a jewel in which he or she stored memories and secrets of the past, passing them to chosen successors when a member inevitably passed away. Our desert homeland’s tumultuous past scattered the Jeweled Sages to the winds, but I am certain that if they were still united as in ages past, they would praise your accomplishments over these past months—while they valued the wisdom of the whole, they also honored the initiative and excellence of the individual. Yet are they truly gone, and I the last? We recently learned that someone calling herself the Diamond Sage has lived in central Osirion for years, and if her agents are any metric, she is as interested in meeting us as I am to finally meet another of my order. What’s more, I have divined that several other sages’ jewels are also buried nearby, though I do not know their exact locations. Because my reputation in Osirion is still stained by last year’s developments, I am sending you, my loyal agents, to find these jewels, locate the Diamond Sage, and arrange for us all to meet formally and determine the future of our fractured order. I am not certain quite what to expect when we finally meet the Diamond Sage, and I trust I will have your insights to aid my own judgment of the matter. The Pathfinder Society has been most generous in providing me a home and offering its support in our endeavors. Even now I am working with Venture-Captain Norden Balentiir to orchestrate a formal Pathfinder expedition to the trade city of Eto, where I hope you can pick up the trail of my elusive colleague. I owe the Society much for its aid. When our business near Eto is done, let us remember your fellow Pathfinders and the equally monumental task they face to the north. Have you noticed our offices’ recent renovations: the intricate rugs, delicate vases, and shining candelabras? I felt it appropriate to spend a fraction of our recent profits on enhancing our image to reflect the lucrative business deals that you have helped secure. Through some delicate handling, the dwarves and the Kalistocrats are both willing to do business with us, though I imagine it’s only a matter of time before their rivalries flare up and force us to choose who our real friends are. Even then we shall enjoy the fruits of cooperation with the Rahadoumi, whose location offers us greater access to the west coasts of both Garund and Avistan. Before we break open the Chelish wine, however, we must maintain our momentum; I can manage the consolidation of what we have already acquired if you can find and seal more contracts. Making our mark on the Katapeshi markets will have to wait until our network is particularly robust, so look elsewhere. I have made arrangements with the Pathfinder Society to send you to Eto, a thriving crossroads city in Osirion, to see what you can learn there. Should you meet a particularly capable powerbroker or merchant lord, see if you can bargain for a few trade secrets or news of any up-and-coming trading centers worth our attention. Of course, I expect you to follow through on that advice, so be prepared for extended travel. Stay well while you are abroad. My colleague Guaril Karela has been looking particularly ill recently, and each month that passes seems to age him another year. I also hear that my mentor in Qadira is bedridden, and I shall travel to see him soon. You’ve heard, haven’t you? At least half of the family seems to be running around half-mad. Well, let me assure you that hearing the word on the street is hardly the same as seeing the writing on the wall; anyone who thinks she can send assassins to stick a knife between old Guaril’s ribs is in for a nasty surprise—at least half a dozen nasty surprises with 20-inch biceps and iron-studded cudgels, in fact. Fortunately, the Pathfinder Society knows just how valuable our services are and has volunteered some extra muscle to ensure that my head and neck do not end their longstanding partnership (I find the two have grown rather attached to each other and would terribly upset if separated). The key now is finding out which rats think they can take on the Sczarni and where their little warren is. I have to say, your work so far has turned up some strong leads; keep this up and you’ll go far in the family. What I’m not so happy about is hearing that my former business associate is one of the ones selling me out! What’s worse, he’s done a truly professional job of covering his tracks—so much so that none of my cousins have been able to track down our real enemies. I’ve run out of good options, so I’m sending you in to negotiate. The information-broker I’m talking about is holed up in Eto, and the Pathfinder Society has organized a special trip for us to knock on his door and ask some pointed questions (I’m telling you, this deal with the Society is great). Stay sharp, figure out where our enemies are holed up, and don’t promise anything we can’t deliver on. Once you know where our enemies are, contact me. I’ll pull some strings and make sure the Society lends us a hand in busting some skulls and ending this debacle. Of course, when the time comes, I’ll need you to lead the raid. In the meantime, go help the Pathfinders do Pathfinder things—you know the routine. Interesting. Any idea (roughly, not specifically) when the others might be on their way? Any chance for the Siler Crusade one over on Weapon in the Rift, too? Within a week—likely a blog that goes up a little later on Monday. The Silver Crusade has a lot of in-scenario support for their task(s), so I'm confident that those faction members should have no difficulty in #5–13. Cool beans, no problem. Wasn't sure if it would matter, though it would be cool to have it hand delivered in that one. I'll buy this if you change the quote on the main page to "Look ON my works." All three chapters are intended to be played in order. Not wanting to spoil anything, but is this more of a Glories of the Past (once you have chronicle sheets for all three...), Rats of the Round Mountain (must be played in order, without interruption), or perhaps other kind of situation? I have not written or developed any final boons, but I know that "must be played in order" boons are frustrating unless one can schedule things just right. As a result, these are much more likely to be Glories of tbe Past-style. Excellent! I was quite pleased with how it was handled for that series. Thanks very much! do anything to alter or manipulate the plans. As a scenario the whole things progresses okay without the players foiling Torch in the slightest, but in terms of secondary success the module states if Torch doesn't detect two ruses, not that necessarily any were performed. Would a 100% helpful party still get that credit for Torch getting his way? I'm prepared to be like "this guy is bad news for the Society" but having a venture captain and a faction patron initiating the dealings, I think the "cooperate" tenant of the Society may be too strong a pull. I fully expect no check marks to be placed at the end. "Would a 100% helpful party still get that credit for Torch getting his way?" Absolutely. They were never caught sabotaging Torch, so they did not get caught more than once. Wrecking his plans is not required for the secondary condition, keeping the token to contact Amenopheus is. Is there an ETA on when the next scenario to be set in Kaer Maga will be released? Torch tells the PCs that Kaer Maga is where the Sczarni need to look to solve their problems related to their faction letter, and I want to run both parts of "City of Strangers" to introduce my new players to the area (and Miss Feathers) prior to that. Just wondering how much lead time I have. Expect it to be #5-18, appropriately titled 'The Stranger Within'. So sometime around April 30th then, I suspect. I'll mark "The Stranger Within" tentatively down for a May 15th game slot. I hope that Miss Feathers gets to make another appearance! Keep on Vrocking in the Free RPG Day! I just recently started GM'ing Pathfinder Society, and this series has been reccomended to me. But I understand that there are some recurring NPCs from prior module(s). Can anyone slip me a spoiler and let me know what priro modules I should GM before this in order to give my players the full experience of the recurring NPCs?